In the wee hours of the morning, when it’s still dark out and Borys and I would rather be catching some Zzzs, than propping our eyelids open with toothpicks and accompanying our two year old to breakfast, we will do almost anything to remain wrapped in the comfort of our warm sheets. On a regular day, Niko will wake anywhere from 5:15 to 7am. 7am? 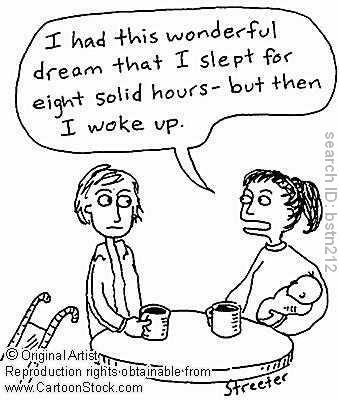 That’s actually OK, and I would even consider that sleeping in, in I’m-a-parent-of-a-toddler land. But anything that starts with 5 or even early in the 6s is just way too early! 2) Bring him into our bed. 3) Turn on the TV – quietly. 4) Give him a drink. And then this weekend a new strategy to add to the list. 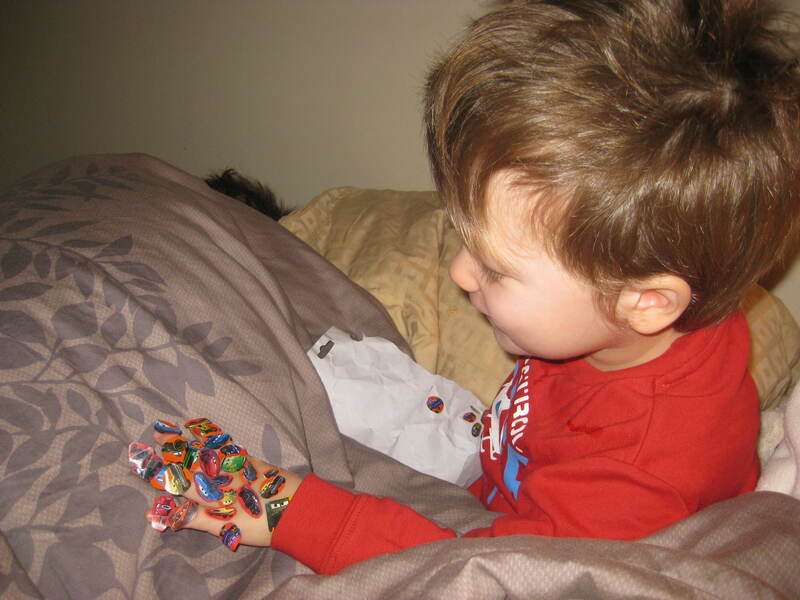 6) Supply him with about 100 stickers for dozens of minutes of extended shut-eye for mama and daaa-deee. This is how it all went down. 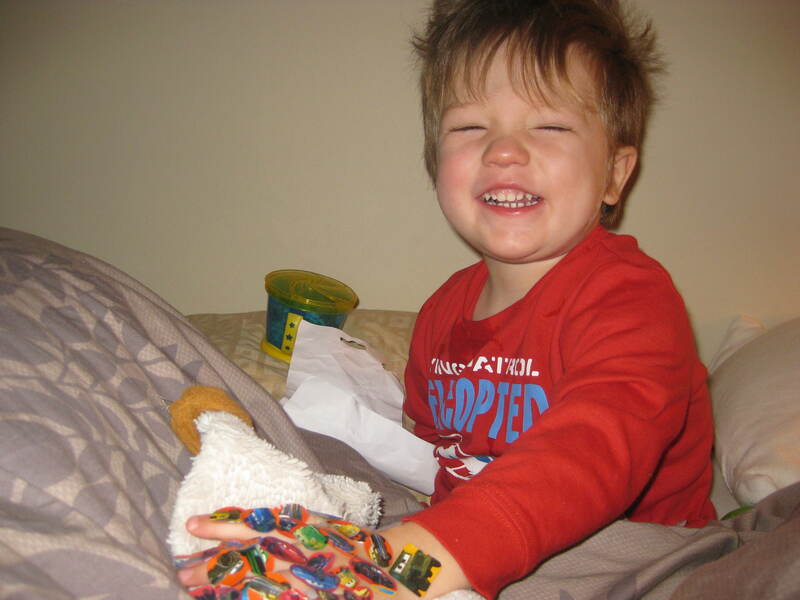 After duly beckoning and then receiving steps 1 through 5, Niko was uncharacteristically quiet on Sunday morning. 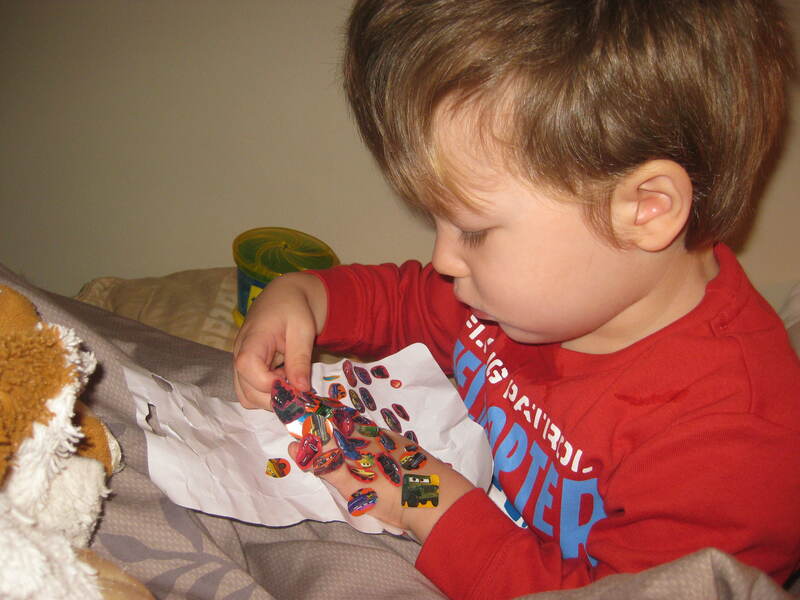 I just drowsed the minutes away, enjoying this quiet reprieve, occasionally and only half-consciously taking a piece of broken sticker-surround from his passing hand. The happy chirps of his chatter a far off sound in my sleepy state. When I finally did fully awaken at 7:20 (hip hip! 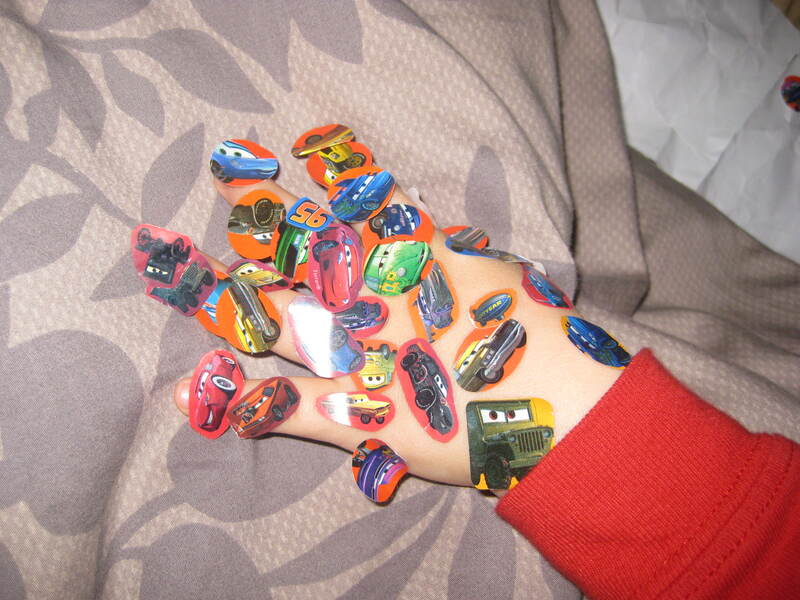 ), it was to the site of one happy toddler with a left hand completely covered in stickers. To be honest, the site of it was a touch disturbing and before I fully clued into what covered his hand alarm bells sounded in my head, but those minutes of extra sleep were all worth it! Note the tell-tale signs of sleepy-daddy-hair in the top left corner of the first picture below. You know, I often feel really lucky that Niko sleeps so well in the night. A lot of the times he makes it from 10 or 11pm to 4 or 5 am. However, last night my luck seemed to have run out! He was up like clockwork every two hours and hungry! What is going on? Maybe he is going through a growth spurt? I don’t know. But ironically enough, today he has been napping for 3 hours (or more) straight! It seems like his clock is off for this last 24 hour cycle! At least I don’t have to worry about sleeping in or missing appointments: having Niko is like having a living, breathing alarm clock sleeping right next to me!